Luxury Developments – Million Dollar Listing Domain For Sale! While the signs of economic recovery in Miami’s real estate market were being reported last summer in anticipation of the December art and design fairs, the New York property scene was also undergoing something of a renaissance. Grand schemes have been brewing in different parts of town, developers have been in fervent planning and many leading architects are now flocking back to the city after the hiatus caused by the noughties’ financial turbulence. The result? Construction is booming once again in Manhattan and beyond. And while in Miami the quest lies in creating the most iconic seaside condo with the best ocean views, greenest gardens and most exclusive pool bar, in New York, this friendly competition often turns to height. The designed 432 Park Avenue tower – set to be the tallest residential building in the Western hemisphere – is already underway and slated for completion by 2015, while another mega-tower (designed to reach 411 metres high), the 111 West 57th Street by SHoP Architects, will break ground this summer. Luxury developments by some of the biggest names of international architecture, such as Zaha Hadid, BIG, Herzog & de Meuron and Shigeru Ban. Many of these flank the celebrated High Line, while others are high-end redesigns of NY classics such as the Walker Tower Residences. Exclusive boutique projects are joined by larger complexes, such as the Hudson Yards development at the western edge of Manhattan. 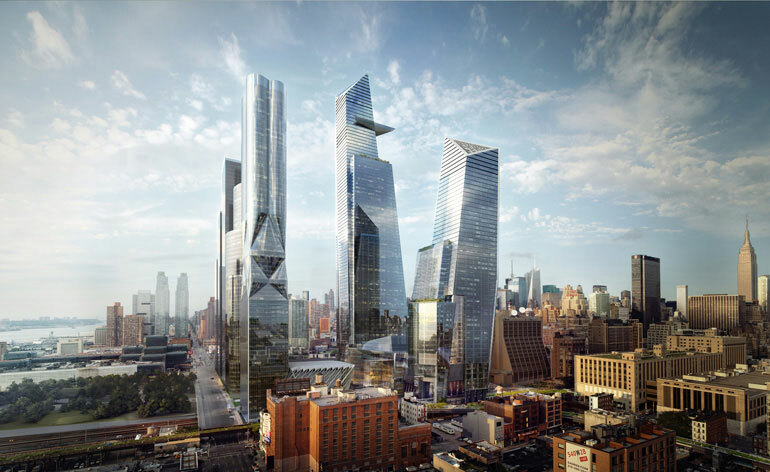 Diller Scofidio + Renfro and David Rockwell are working on its residential 15 Hudson Yards tower, while the gargantuan 28-acre scheme will also include an SOM-designed mixed use residential highrise, and luxury retail and office blocks. Meanwhile Hunter’s Point South in Long Island City by ODA will be a small town of commercial units and affordable housing. The first wave of residential projects will see completion by 2015. The Tower Verre by Jean Nouvel is one of the latest additions to the city’s plans, scheduled to break ground in 2019. New York’s new luxury residential selection is growing by the day, joining the city’s big upcoming cultural and commercial buildings, such as the new Whitney Museum Renzo Piano and the landmark One World Trade Centre, which is gearing up for inauguration later this year.